Reviews Reviews Reviews! 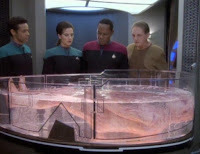 : Star Trek: Deep Space Nine - "A Man Alone"
Julian, look, Jadzia is not interested, pal! Oh, and some murderer gets murdered and everybody believes Odo did it.